A robot bat head! From a Virginia Tech project. Hi everyone I hope you all had a good week! I found a really cool article about how scientists are studying bat echolocation to help with all kinds of things. The US. Navy is making a new sonar for their ships. The new sonar is going to be based off of how bats echolocate. The Navy ships already have sonar, but it isn’t anything like a bat’s. Even though a bat only uses its two ears and a Navy ship uses complicated sonar arrays, bats still have a better idea of what things are. Using information learned by studying bats, an engineer built a prototype that goes on the nose of an undersea robot. The new device can interpret returning sonar echoes like a bat’s ears. It will also be cheaper, and smaller than their current model. Much like the US Navy, researchers in Israel are also information learned by studying bat echolocation. But instead of using the information to help the military, they are using it to help farmers. Farmers sometimes have trouble knowing how much food they are actually going to get from the plants in their field. Some years, crops might yield more food than others and it is difficult for a farmer to estimate how much they will have from year to year. This makes it difficult for them to determine a good price for that year’s crops and how much help they will need harvesting the fields. Scientists in Israel have developed a device that uses bat-like sounds and interprets the returning echoes to determine how many leaves and fruit are on plants in a field. This will help the farmers calculate their yields for the year. 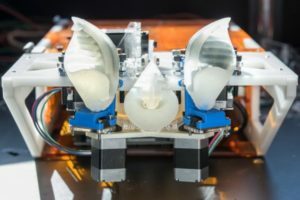 An engineer at Virginia Tech is studying the special folds in the horseshoe bat’s nose and is using the information to make a robot with a special “nose” that will help the robot detect obstacles in its path. 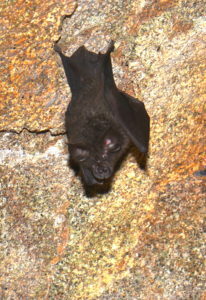 If you would like to read more about how bats are helping humans, you can find the article here. Previous StoryIllinois, a state of mine!